What does the name Arcadia mean? We here at Arcadia have started to wonder recently where the name behind our company may have come from, so we’ve started doing a little research of our own… Explore it with us below! The earliest mention of Arcadia comes from the regional unit (similar to a US region like the Northeast) of Greece, which has existed since antiquity. In its earliest days, Arcadia was a loose coalition of Grecian towns, which gradually came together to form a group of city-states known as the League of Arcadians. This league included many major Ancient Greek cities, including Mantinea and Megalopolis. The main purpose of the League of Arcadians was to protect the region (situated on the Peloponnese peninsula) from invaders, particularly the city-state of Lacedaemon, better known as Sparta. The League successfully withstood attempted invasions from Sparta in the 7th century BCE. Ancient Arcadia was also well-known in Greek mythology as the home of the god Pan, the god of the wild, shepherds, fields, and the mountains. 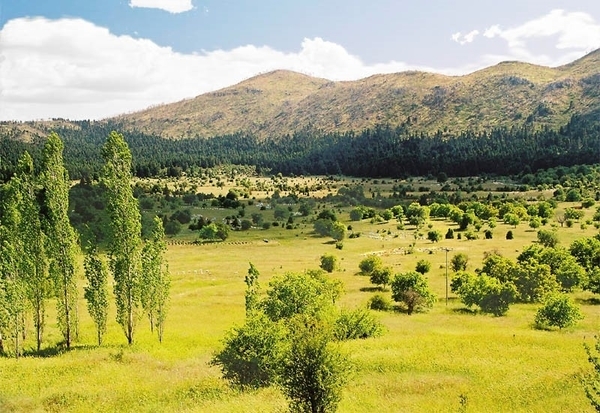 This association was shaped by Arcadia’s mountainous landscape, with large valleys and plains in between the foothills. Due to the vast topography, the population of Arcadia lived in mostly rural settlements, with some small cities in the valleys, similar to the pastoral images associated with Pan. The landscape of Arcadia, Greece. Image by ulrichstill [CC BY-SA 2.0 DE], via Wikimedia Commons. As the home of Pan, Arcadia was viewed as a version of paradise in Ancient Greece, where Pan and his court of nymphs and fairies could exist in harmony. This idealization of the area and prominence in Greek mythology led to the area being heavily featured in ancient art and literature, where it was imagined as an unspoiled, rustic country, whose people lived close to nature, rather than society. This image of Arcadia was even featured as the setting of the prominent Roman poet Virgil’s Eclogues, a series of poems that primarily depicted shepherds in Arcadia’s rural landscape, conversing with one another and performing amoebaean singing, a type of Ancient Greek singing competition. The Eclogues were massively successful when performed in Rome, and led to Virgil becoming a celebrity in his own right. Virgil’s vision of Arcadia in the Eclogues was extremely influential, especially during the European Renaissance from the 14th to 17th centuries. Virgil’s influence caused Renaissance artists and writers to imagine Arcadia as a sort of untouched paradise, shielded from the influence of human civilization. 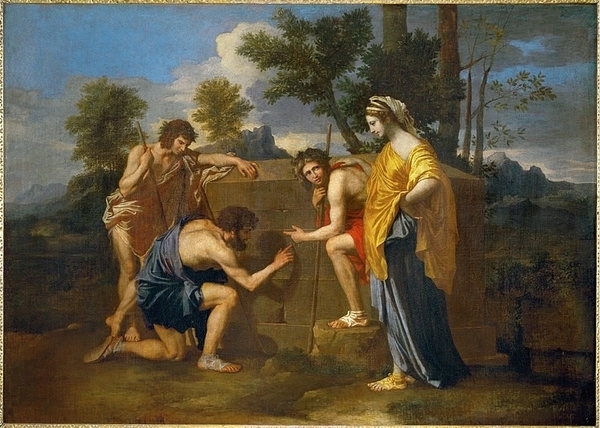 Nicolas Poussin’s Et in Arcadia ego (also known as The Arcadian Shepherds). Public Domain image via Wikimedia Commons. The tomb the shepherds have gathered around is inscribed with a memorial, a scene which is also described in Virgil’s Eclogues V. Virgil’s influence extended much further than the Renaissance, however – even in more modern artwork, Arcadia is still depicted as an Eden-like paradise, where the people live in harmony with nature, rather than civilization. 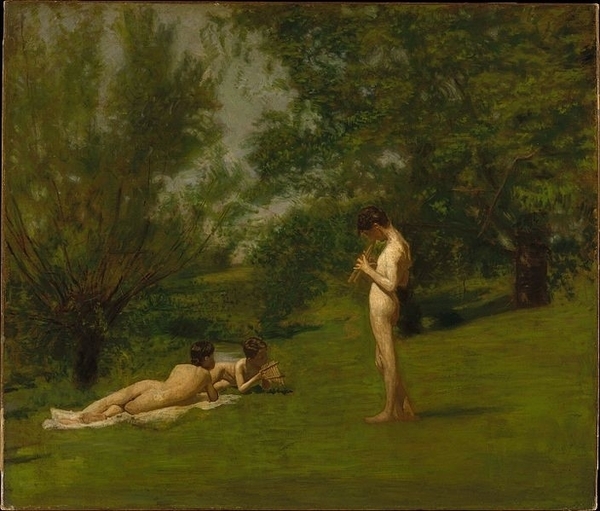 Thomas Eakins’ Arcadia, a 19th century painting depicting the Eden-like Arcadia. Public Domain image via Wikimedia Commons. Although Arcadia may no longer be the home of Pan and his dryads, it is still a thriving regional unit of Greece. It is much larger than it was in antiquity, making up approximately 18% of the Peloponnese peninsula. It is the largest regional unit on the peninsula, with its capital at Tripoli. Arcadia is also still known for its mountainous areas, and has a popular ski resort on Mount Mainalo, which is located near the capital. The region is still heavily referenced in popular culture, with TV shoes like Guillermo del Toro’s Tales of Arcadia, and mentions in video games such as the popular series Bioshock. The name Arcadia has also come to be used as a popular name for cities and towns around the world, including a dozen or so in the US, like Arcadia, California. Here at Arcadia Publishing, our mission is to showcase America’s unique history through the places and people that have helped to create it. That’s why we Googled our own name – to learn the history behind the name that we’re so proud of today! Who knew there was so much in just one name? If you think your town’s name has a unique history, let us know in the comments below!